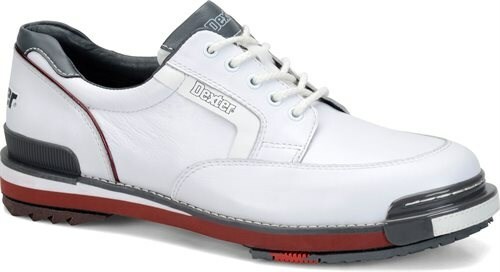 The Dexter Mens SST Retro bowling shoe takes a classic retro look and pairs it with modern technology. 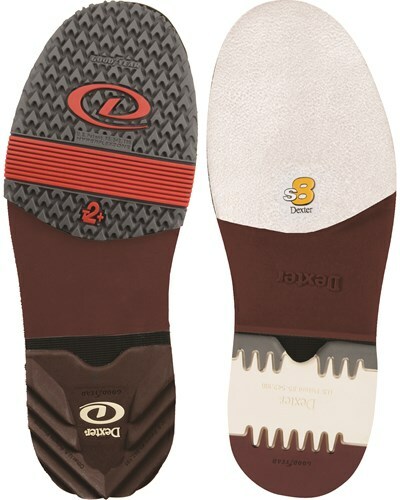 This shoe features Dexter's total interchangeable sole construction which makes this shoe convertible for left hand or right hand bowlers and allows the bowler to customize their slide surface as well as their traction surface. This shoe is where comfort and performance and now retro styling come together to make one great shoe! Very comfortable, great for league and tournaments. First pair I ordered was about a half size to big. And noticed less padding then my old Storm Blizzards. Got them exchanged for a size down. Second pair fit perfectly . Stiff at first but broke in quickly. Very stable footing with limited flex. Do not slide well. Now it's psychological. I think I'm going to stick at the line. I will wear them but more often opt for my less expensive shoes. By wfroh from Richmond, Va.
Great shoe.... I found them to be very comfortable right from the get go. Great shoe. Stiff as hell at first. Wicked comfortable. Should've ordered a half size smaller. Very good shoes have worn dexters for years. Well made. I had the sst8s for a lot of years. I like these shoes because you can adjust them to fit any approach conditions. There are very comfortable, and give you the feel of a good foundation on the approach. They are well worth the money. Bowl on a league and they were comfortable right out of the box, true to size, wish they had come with different slides but great shoe for the price. Wish they came with all the soles like the original SST. By Don from San Anotnio Tx. I got the shoes about 2 weeks ago or so. The are extremely comfortable. The only problem that I have found with them is they run big. I am a true sixe 13 so that's what I got. They are to big and I think the 12 would be a little tight. This was the first pair of shoes that I got with interchangeable soles and I love it. Bowling at 2 different houses being able to get more or less slide has helped out a lot. We are getting several new shoes in stock over the next 2 months. We do not have a release date for shoes like we do for some of the bowling balls so we could be getting this shoe in stock anytime in July. If you pre-order the shoe, we will ship out the shoe as soon as it is in stock. Hello! I don't think we are planning to get this shoe in particular in smaller sizes at the moment. Don't I need to specify left hand or right hand? Hello Jerry! No, you don't need to specify. The shoes have interchangeable soles and heels on both feet. Hello Austin! I wouldn't recommend this shoe for a toe dragger. I would probably go with either the Dexter Mens SST 6s or the SST Tank shoes. Those would probably hold up a little better. Hello Paul! Yes, this shoe uses the same soles you would use for the SST 8 model. Have this shoe in wide width ? Hi Gino! The only shoes that we have on our site that come in a EEE width are the Linds Mens Classic Black. Does this shoe come with extra soles and heels? It does not come with any extra soles or heels. Any of the SST models will be comparable to the SST 4s. Right hand bowler or right foot slide? Hello. These will have an interchangeable sole. If you are right handed the slide will be on the left and vice versa. are you planning on creating different colorways? At this time, the SST Retro will only be available in the colors as advertised online. This shoe does not include shoe covers. What kind of a slide does this shoe give? Also, is this a good shoe for an average league bowler? This will have a medium slide and it is an excellent shoe for average bowlers. Does this come with extra soles? Unfortunately, these will only come with the soles on the shoes already. At this time, they will only come in a standard D width. Yes, they will have a one year warranty. Yes, these will fit like the SST 8 shoes. Due to the time it takes to produce the Dexter Mens SST Retro Right Hand or Left Hand ball it will ship in 2 bus. days. We cannot ship this ball outside the United States.